Note that in the Eclipse Mars timeframe, a formal installer was created for use with Eclipse. I have never used this (don't feel a need to) and so little to nothing in this page deals with that experience. However, the principle of a finished installation remains relevant. In short, put it somewhere over which you have complete control and you will find bliss in your life. If you're going to develop Java software, you must download a JDK because this is what gives you Javadoc in Eclipse ContentAssist. 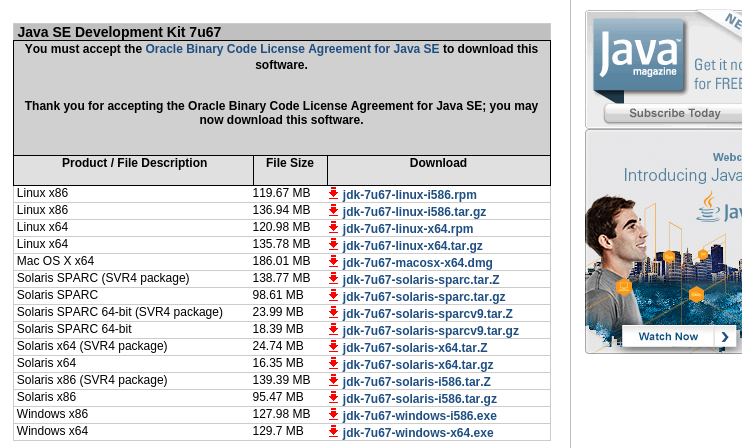 I do not download and install a JDK for my whole computer. I leave my computer's idea of a JRE to be whatever it wants. I let it install and update separately from my Eclipse usage. I have a peculiar way of setting up a JDK as illustrated here. 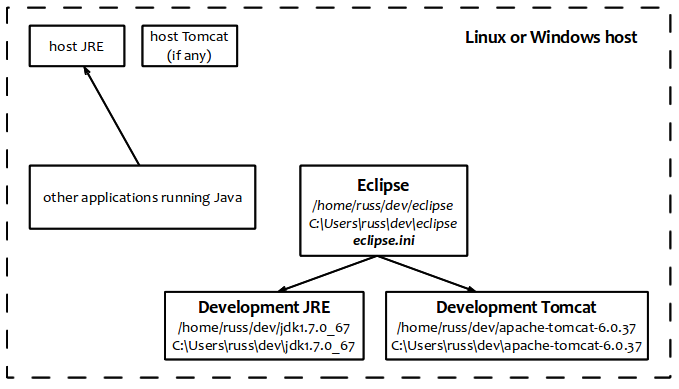 As noted and as you should see from my diagram, I do not blindly install a JDK over the top of whatever my computer is using as a Java Runtime Environment (JRE). I make a separate copy. This is so my host is not disturbed in the natural update of its JRE. That JRE gets updated whenever it wants to be. More than that, it is so that when I run Eclipse, I know what version of the JDK I'm running and it never changes unless and until I decide it will. 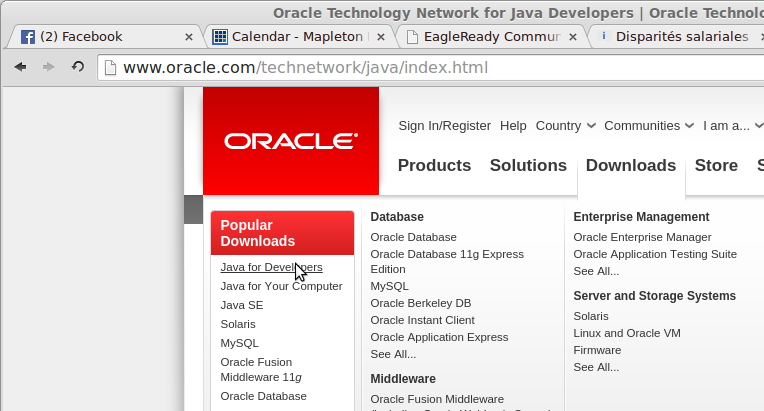 As shown, click on Java for Developers. 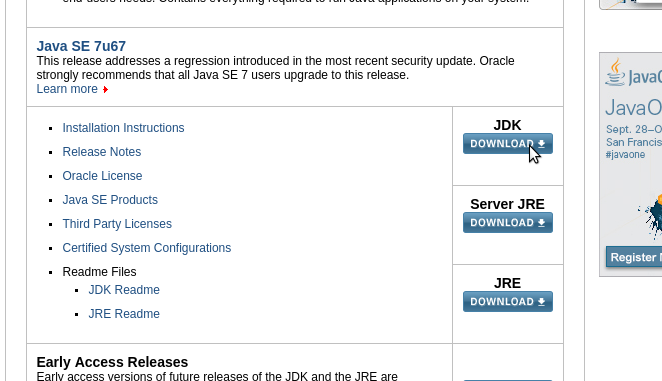 As shown, click on the Download button underneath JDK. Note that this isn't a zip on Windows, but a self-extracting archive with a .exe extension. At some point during extraction, you can choose where to put it (instead of clobbering the JRE installed on your Windows machine). Put it on a path such as the one(s) I suggested earlier—in a personal location under your user. This is a rather more advanced undertaking so I won't illustrate it here, but give some links to notes to peruse. Why would you use this instead of Sun's JDK? Because your company, for whatever reason, has a legal or moral aversion to Oracle software. I usually use the Sun version, but I've had little trouble at all with the openJDK. I'll doctor eclipse.ini, according to http://wiki.eclipse.org/Eclipse.ini to point to my JDK. 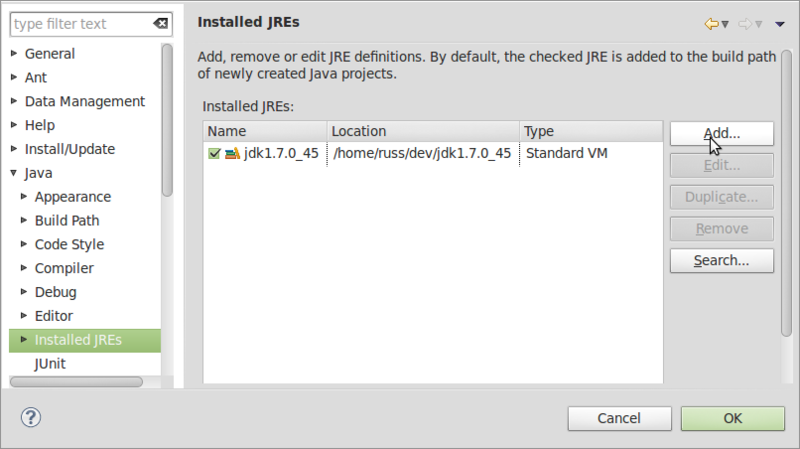 I could run Eclipse off my host's JRE, but I'll just run it off the JRE inside the JDK I just downloaded. This Eclipse Wiki page explains how to set up eclipse.ini whether for Windows, Linux or Macintosh. In my case, in bold below, I've added this. If left to its own devices, Eclipse might very well find my host's JRE, but this way I'm telling it what to use. Continuing, I click Add as shown, then Standard VM. 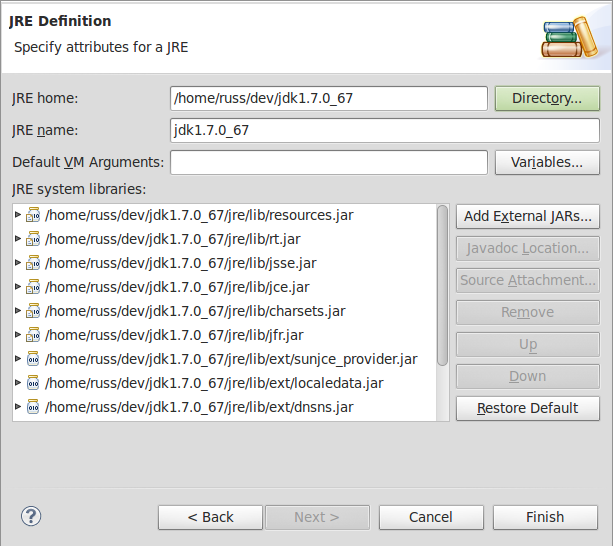 Opposite the JRE home edit field, I click the Directory button to navigate to my new JDK, select it and click OK. I click Finish, see my two JDKs (if the first time, then there will only be 1). I ensure that the checkbox next to it is checked. I can also dump my old JDK if I want by selecting it and clicking Remove. I install Tomcat separately from any I might have on my computer for the same reason I don't want Eclipse to use my host's JRE. Also, I use Eclipse to deploy my web applications to Tomcat, the one it knows about. I don't usually debug web applications on a formally running Tomcat. Window → Preferences → Server → Runtime Environments. Click Add, click the version of Tomcat you want to use, click Next, then Browse to the top of your exploded Apache Tomcat download and click OK.
Just JDKs, you can choose to tell Eclipse about as many as you wish. (You can also set up JBoss and other server containers too.) When you create a Server for the workspace, you can choose one or more of these, then launch them from the Servers view. To use Tomcat or other server containers with Eclipse, you must have downloaded the Eclipse IDE for Java EE Developers package from eclipse.org or you can take the after-market route as described by How do I install WTP?. Especially if upgrading past one or more versions, download and install the new version you want (not on top of your existing version), then start it and point to your existing workspaces. You can save preferences from your existing Eclipse installation to a file, then restore (import) them into the new version. If you had third-party plug-ins and want them in the new version, you must go through Help → Eclipse Marketplace to find and install them again. .p2 under your home subdirectory, if present.